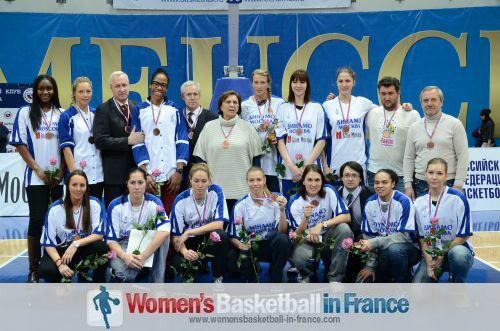 2007 EuroCup Women Champions Dynamo Moscow from Russia beat Kayseri Kaskispor from Turkey (66-61) in the first game of the two-leg aggregate score final. Dynamo Moscow failed to make home advantage really count despite a lively opening quarter (24-15). During the second quarter Kayseri Kaskispor were able to apply defensive pressure that restricted the hosts to just 8 second-quarter points. Dynamo Moscow led by just a single point (32-31) at the break. But three minutes into the third quarter they trailed by 5 points. Neither side was making many shots and by the end of the third quarter the game was tied (45-45). A three-pointer by Svetlana Abrosimova with nine minutes to play broke the deadlock and Dynamo took hold of the match for good. Kristi Toliver exploded offensively in the final quarter with 9 of her 16 points as Dynamo fought to open up a significant advantage. However with Lara Sanders (11 points) and Evanthia Maltsi (17 points) hitting free throws down the stretch of the last four minutes the Turkish side minimised the damage and trailed by just five points at the end of the game. 2012 EuroLeague Women Final 8 MVP Asjha Jones led the way with a game high 18 points. For Dynamo Moscow the following players finished in double-digit scores: Toliver 16, Crystal Langhorne 13 (13 rebounds), Tatiana Vidmer 10, Abrosimova 10.